Springtime in Perth is not without its dangers. 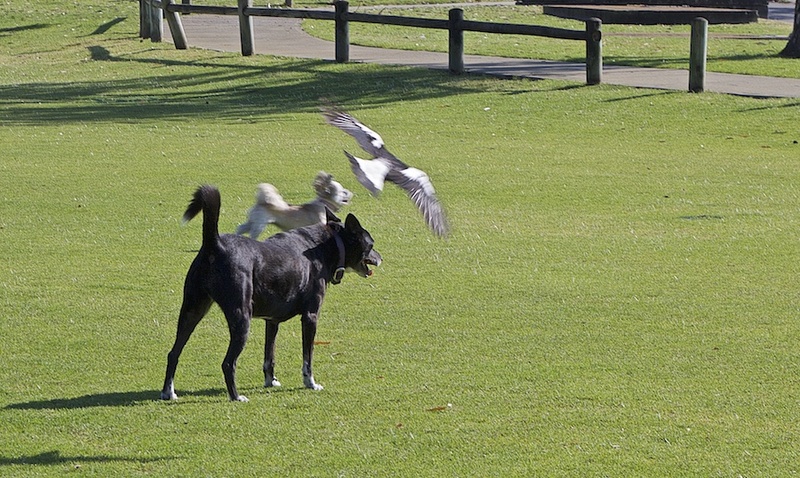 Nesting birds can get aggressive and attack passers-by. Chief amongst these are the magpies, but honeyeaters and even the tiny willy wagtails will have a go at you. 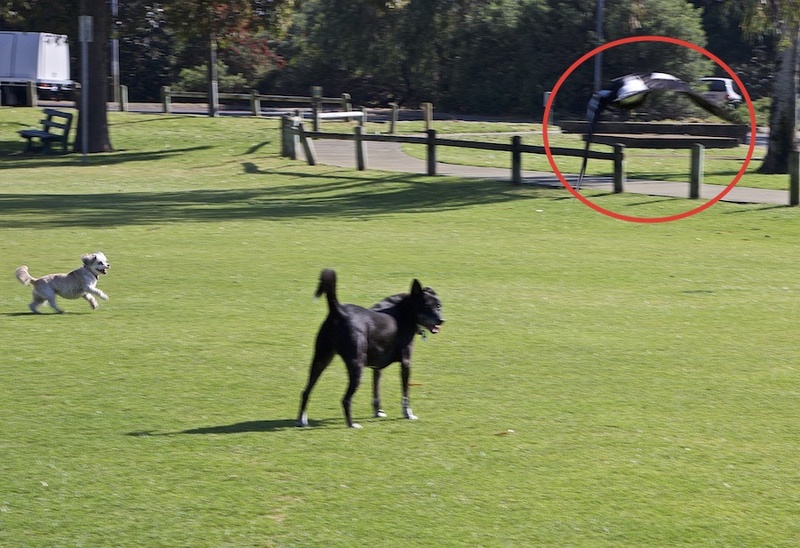 Here's a newspaper report, with a video of swooping magpies to give you an idea of what it's like. There are even websites where you can log an attack and warn others. I've had them attack me many times when I used to cycle commute (back in the bad old days when I had to work), and sadly, there's been a few cases where children have lost an eye to these magpies. 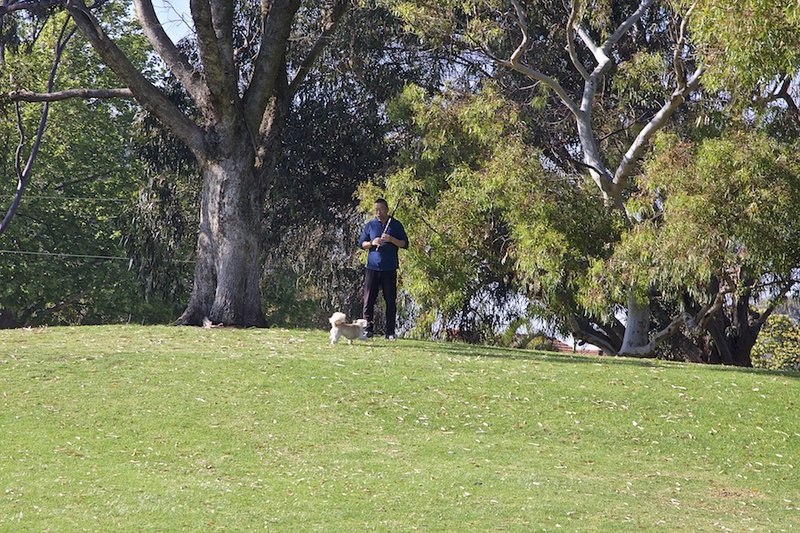 The other morning, I was taking Zhaan and Molly (Son No 2 and his wife's dogs) out for a walk in the local footy oval. It started nicely enough. Quite unusually, we hear a bloke practising his flute, and little Molly went to have a look. The flautist seemed a little concerned at Molly's approach. Seeing she posed no danger, he resumed playing. As we continued on our walk, there was a swoosh over my right shoulder and through my viewfinder, I could see that Molly was ready for the magpie attack. 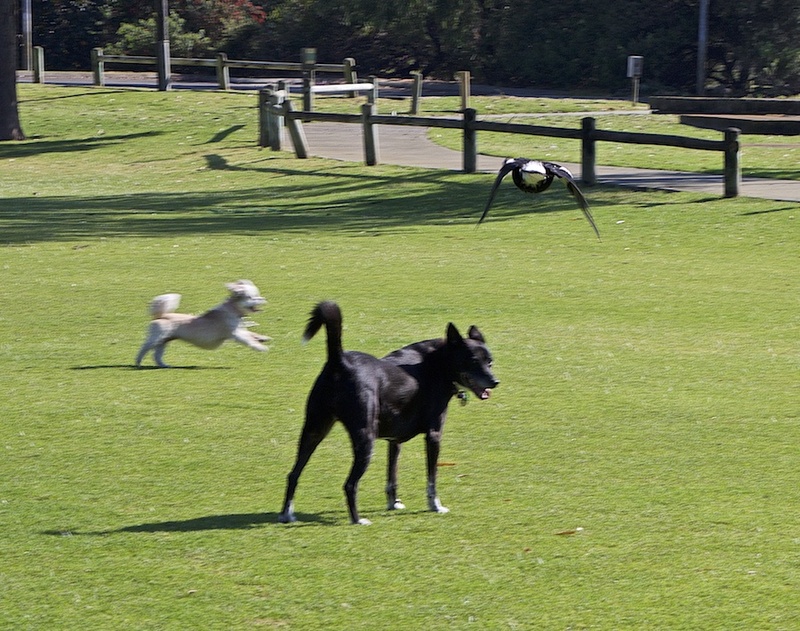 The magpie was heading for Zhaan, but Molly was ready for it. The incident caught me on the hop, and my focus was all over the place. 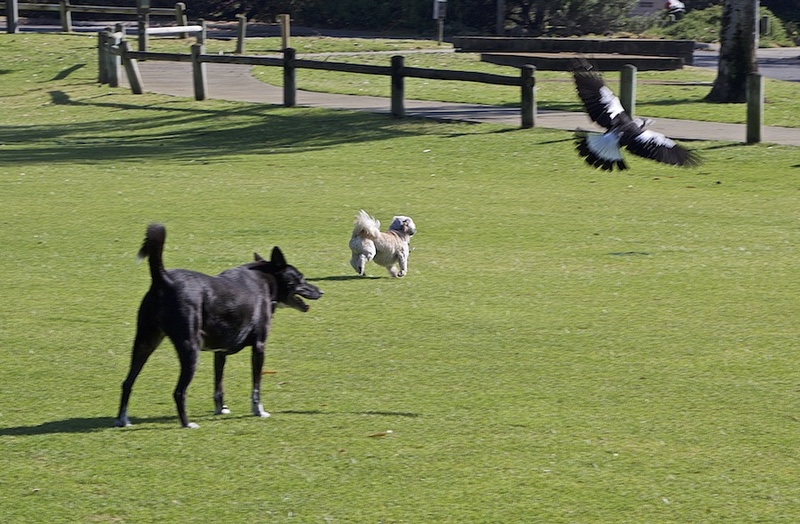 Brave little Molly engaging the magpie in a skirmish. Well done, Molly. The magpie retreats. 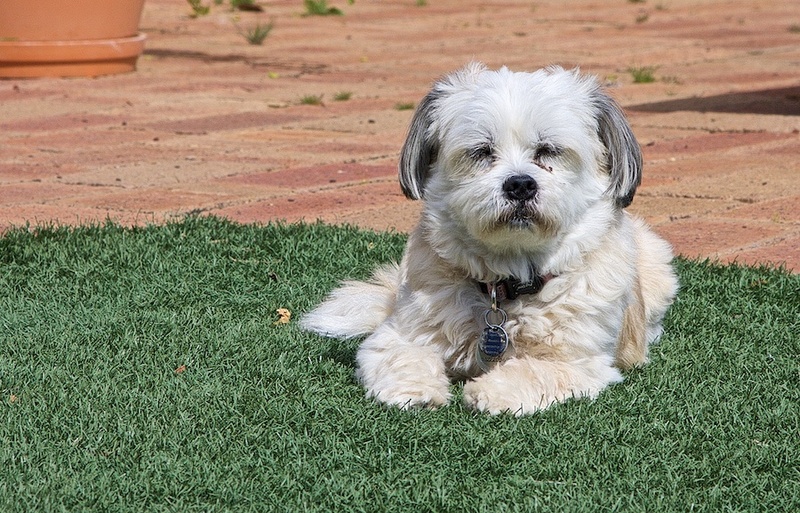 Molly - the heroine of the day. Thanks, Reader's Tales - and you have a lovely day yourself, in that beautiful city of yours. Wish the whole incident was captured on video. It would make a nice video show "Molly vs Mad Mag". Seems that Molly has some musical inclination too. I agree video would have been ideal. Search for "Magpie Attack" on YouTube and there're lots of them. Oh my!!! So fierce, those birds! We have some big noisy black birds in our neighbourhood. I use firecrackers to scare them away but they keep coming back. Are the black birds crows? They're supposed to be very intelligent. The crows here could imitate my previous dog's bark to distract him and then try to steal his bone. Zhaan didn't seem to notice the magpie at all. Or perhaps he was just nonchalant. Haha. I've seen 1 attack a cyclist once on my way to work. It was swooping & pecking at his helmet & he was trying to cycle & wave it away at the same time. Another time I saw a duck attack a man. I don't know if he provoked the duck but he stumbled onto the road right into the path of the car in front of us. That was a close call. These birds can be quite dangerous. The magpies usually go for Zhaan as she is the bigger dog, I think. She is quite used to them and ignores them. I used to cycle to work (which was close to home, about 5 km) and have been attacked many times. They come and hit the helmet with either the beak or a wing. Many such videos on YouTube, by the way.